Following my three best lap times being set and submitted in May, June and July at Eastleigh, I had the opportunity to race in a Track Attack session (which is basically a semi-final for Teamsport’s Kart Champs competition). The format of the evening mirrored that of the “unlimited” sessions; there were five sessions of ten minutes each, with the fastest lap time in each period (for each driver) being added together to make a total time. It was this total that decided the winner in each weight category. 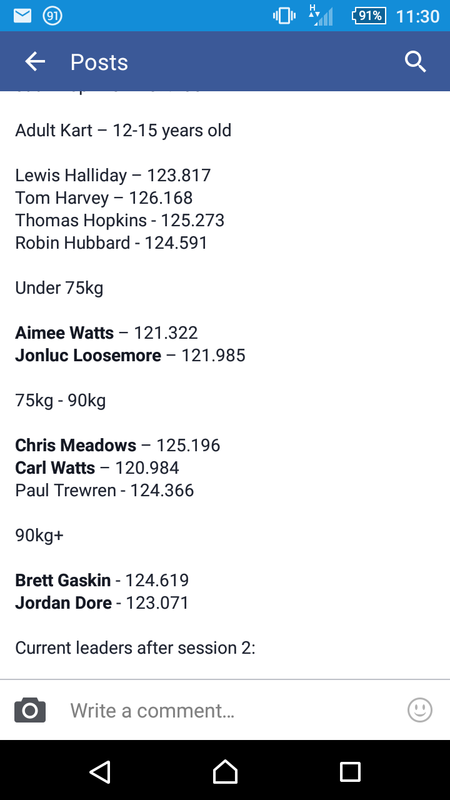 Going into this session, I was made aware that there were only two “heavyweights” remaining in the competition at Eastleigh, and that myself and Jordan would be going head-to-head in this session, with the winner basically sealing his place in the Grand Final in Reading. There was definitely a competitive smell in the air, albeit mostly friendly, with all of us chatting away before we started and also in the breaks between sessions. One of the running jokes throughout the evening was Jonluc’s new kart suit being very similar to mine and that he was copying (and cramping) my style. After the laughing and joking, the racing was taken very seriously; I went for it from the word go, resulting in a spin for me on lap two of the first session. Fortunately, I had managed to get enough of a lead that I could spin it around without causing a yellow flag. I kept on pushing, however, and even got close to beating my all-time PB, with a best lap of 25.253s, despite me not really feeling in control of this particular kart all of the time. I finished 6th out of 7 karts, but what was important here was the time difference between mine and Jordan’s best lap; unfortunately for me, it went in Jordan’s favour by 0.337s. I felt the pressure building; I thought that taking about a tenth off Jordan in each of the next four sessions was possible, but was still a daunting task. My second session was far more consistent; only four laps were outside of 25.750s and I even managed to break the 24s barrier for the first time at Eastleigh. I finished 5th this time, but Jordan was ahead again, taking another 0.297s out of my best this time around. Whilst I was still very much in the competition, the uphill struggle was seeming like a sheer vertical ascent at this point. I did race well in the third session, beating my PB yet again with a 24.811s lap right at the end, placing me sixth this time around. The gap was still widening between myself and Jordan, but this time, there was less than a tenth of a second between us. I had to take a chance in the final two sessions to get through; if you watch the video below, you can see that I pushed too hard at times! It was unfortunate that, in this session, I let any chance of the win slip away from me. Whilst I didn’t have the kart I wanted underneath me to challenge Jordan’s lead in this session, what annoyed me more after the session was that I let it get into my mind, and this affected the way I drove for far too many laps; it was only on laps 16 and 17 that I got my head back into the game and became competitive again. I still managed to pull a sub-25s lap out of the bag, but Jordan finished nearly half a second ahead of me just in this session alone. His lead was now over a second and the chance of me pulling that out in the final round was slim-to-none. Nevertheless, I was not going to be defeated until the chequered flag fell for the final time. As I started the final round, I was determined to be more positive and try to get my consistency back from the earlier rounds. I managed to achieve this and then some; there were only two ‘bad’ laps throughout the session (i.e. over 25.750s) and I managed to go sub-25s five times in the session, smashing my PB again with a 24.732s. A little while later, the official results were confirmed on the Teamsport Eastleigh Facebook page; I had finished with a combined time of 124.619s compared with Jordan’s 123.071s total. To put this in context, both of our times would have been competitive in amongst the lighter driver categories, despite some of the other drivers weighing far less than us. I could take one more stab at getting into the finals in the last chance saloon on Tuesday, although it’s a difficult decision; I don’t want to miss out on the opportunity to race in the Grand Final, but it is yet another expenditure both financially and in terms of my time. Oh well, only time will tell!